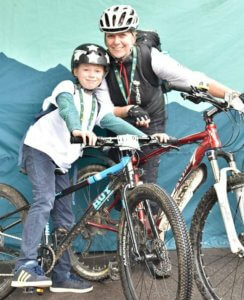 We would like to say a very big Thank You to everyone who supported our Family Bike Ride on Sunday 12th August. 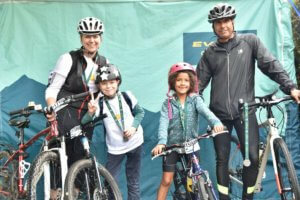 All four members of the team – our Chairman and his daughter, along with our Treasurer and son – made it round the Evans Cycles Liphook Sportive, Fun 17 mile route in approximately 3 hours. Miriam (age 7) and Morgan (age 8) were particularly proud to collect their Finishers medals just as the rain started. Thankfully there were no incidents along the route, and much fun was had by all. The team raised over one thousand pounds for Story FMR– well done!